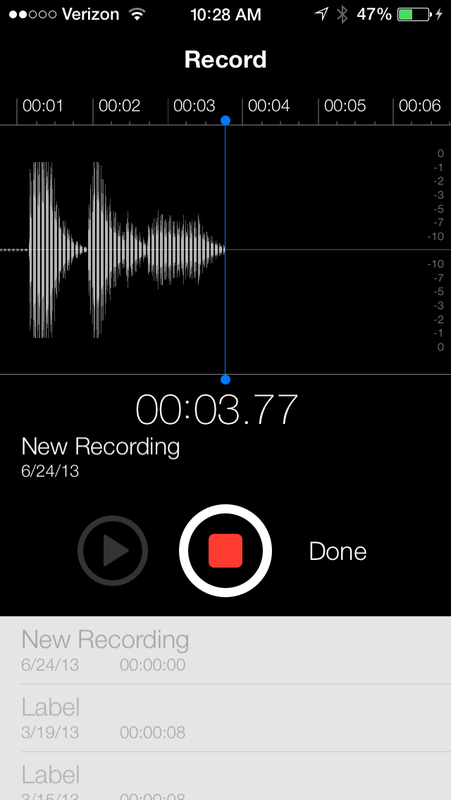 In the first beta of iOS 7, the Voice Memos app was notably absent. Apparently, Apple deliberately left the app off the initial beta version of the upcoming software update. But now, Voice Memos has made its triumphant return as a completely redesigned app in iOS 7 beta 2, which was released by Apple to developers yesterday. And we're featuring the app in our hands-on preview video below. As expected, iOS 7's Voice Memos app has a new icon, characterized by a sound wave on a white background. But while its new icon is arguably unattractive, its interior is anything but. In the video, you can see that Voice Memos sports a layout far removed from its previous versions. As noted by Dom, it has "more of a recording studio-ish feeling to it," akin to a digital audio workstation software. This comparison is reinforced by what is perhaps the neatest new feature of the app: while recording, Voice Memos creates corresponding waveforms in real time. If you can't see the video embedded above, please click here. Of course, you can still pause and restart any recording in the updated Voice Memos app. What's more, you can now name every recording you make, making it easier to find a specific recording from the app's list of recordings. From the list, you can initiate playback, editing, sharing, and deletion of any recording. So, that's the new Voice Memos app in iOS 7. Oh, and there's one more thing … While recording, you can go to the lock screen and see the lock screen interface for Voice Memos. Considering how polished this alternative interface is, Dom speculates that quick Voice Memos access may be added to iOS 7's Control Center for, say, when you need to record a voice memo in a hurry. For more hands-on videos about some of the new features and notable changes in iOS 7 beta 2, check out: Hands-On Comparison: Is Siri In iOS 7 Better Than Siri In iOS 6?, Hands-On Video: Improved Avatar And Timestamp Support In iOS 7's Messages App, and Full Walkthrough: Apple's iOS 7 Beta 2 Running On The iPad.